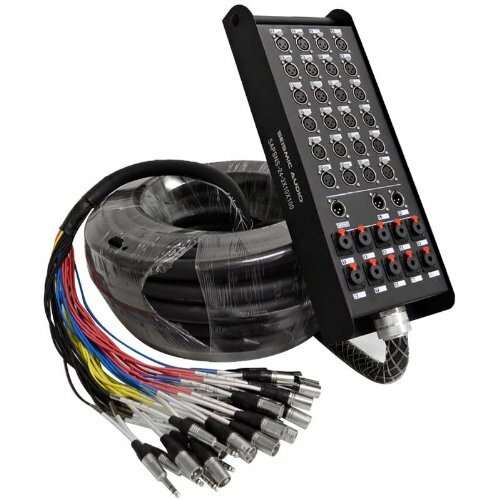 24 Channel 100' Snake Cable (Compatible with PreSonus 24.4.2 Digital Mixer) - Model #: SAPSNS-24-3x10x100, Works with Presonus Studio Live 24.4.2 Digital Mixer, Sends: 24 XLR Connectors, Returns: 3 XLR Connectors & 10 TRS 1/4", Length: 100 Feet, Weight: 69.8 lbs., Condition: NEW, Fantail and stage box are both clearly numerically labeled, Fantail is color coded as well, 100% individually shielded pairs, 22 gauge heavy duty conductors, Heavy duty steel stage box with handle, High quality XLR connectors at both ends, Heavy duty strain relief at both ends, One Year Warranty. The SAPSNS series of Seismic Audio snake cables were designed to match up perfectly with the Presonus Studio Live Digital Mixers, as well as other popular mixers.. The SAPSNS-24-3x10 series is an ideal snake for those that own the Presonus Studio Live 24.4.2 Digital Mixer. This snake box and fantail matches up perfectly with the connectors on the back of the Presonus 24.4.2. This snake has 24 XLR inputs, 3 XLR Outputs (Two for your Main Outputs and one for your Mono Output), and 10 TRS 1/4" Aux outputs. Great for studio or live performances. These snakes provide maximum flexibility by offering both XLR and 1/4" connections for the returns. High quality XLR connections, easy to read color coded wires on the fantail. Rugged steel box to withstand the rigors of the road. 22g Oxygen-Free Copper (OFC) conductors for enhanced signal clarity and superior RF rejection. Returns: 3 XLR Connectors & 10 TRS 1/4"